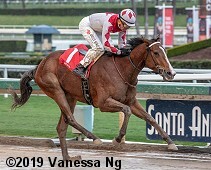 The feature race on Sunday at Santa Anita was the $200,000 San Vicente Stakes (G2) for 3-year-olds going seven furlongs on the main track. 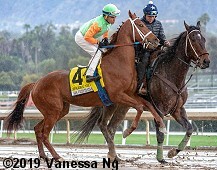 Rain through the day downgraded the main track to wet-fast with temperatures in the low 50's, and turf races were moved onto the main track, with just 5,363 fans in attendance. A short field of just 5 made final entry, with Coliseum sent off as the 7-10 favorite off his 6th place finish in the Sham Stakes (G3). In to challenge him included 2-1 second choice Dessman, a debut winner last out, and 13-2 third choice Savagery, an allowance winner after finishing 7th in the Sham. Jockey Heriberto Figueroa sent Savagery to the lead exiting the chute through fractions of 22.07 and 44.32 while pressed by Coliseum and stalked by Dessman. Entering the lane Savagery tired as Dessman inherited the lead through 3/4 ion 1:09.16. 7-1 fourth choice Sparky Ville, 4th early under Joel Rosario, put in a strong late rally to nail Dessman at the line by a nose in 1:21.93. It was a long 6 1/2 lengths back to favorite Coliseum third. Left: Sparky Ville in the winner's circle. Winning trainer Jeff Bonde said, "This horse seems like he's more adept at seven furlongs to a mile so I'm not sure he wants 1 1/4. I could tell my horse had won, but I was so excited in the stretch I thought I was gonna pass out. 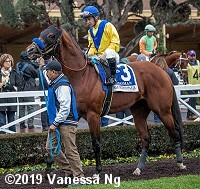 We are very happy with the way our horse had trained for this race, but it's always scary when you get a look at those Baffert �Maseratis', it pretty much unfolded the way we had hoped. 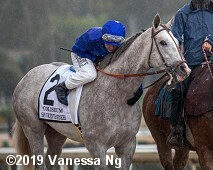 The people that own this horse, they've got this colt a seven furlong-miler type maybe time will tell differently, but the other colt they are focusing on him going the two turns." Right: Sparky Ville returns after the race. Left: Sparky Ville in the paddock before the race. Right: Sparky Ville rears up in the post parade. Winning jockey Joel Rosario said, "Going into the far turn, I was in tight, but I had to wait because I thought those horses were moving a little early. When we left the quarter pole, I asked him and he really picked it up. I thought those horses would come back to me and we would win easy, but (Dessman) kept fighting and it was close. 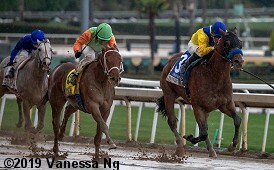 I knew he had run well with Gary (Stevens) and I'm happy with the way he ran today. He was comfortable sitting in behind those horses and I like the way he picked it up when I asked him to go." Second place finisher Dessman in the paddock. 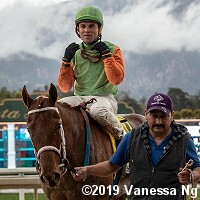 Jockey Flavien Prat said, "I moved too soon. He fought back when he saw that horse. He ran great." Right: Third place finisher and beaten favorite Coliseum in the post parade. The Bob Baffert trainee improved his record to 1 win, 0 seconds, and 1 third in 3 starts, earning $56,151 for owner-breeder Godolphin. 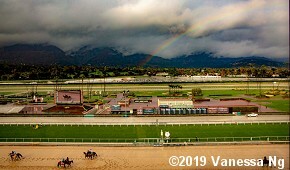 There was a rainbow over the mountains behind the track before the 6th race. It was rainy all day and quite chilly for California. 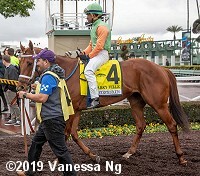 Immediately before the San Vicente was the $100,000 Sweet Life Stakes, originally scheduled as a Grade 3 event for 3-year-old fillies sprinting 6 1/2 furlongs on the downhill turf chute. However the race was taken off the turf leading to one scratch and the race losing its grade. Apache Princess was sent off as the 6-5 favorite in the field of 5 off 2 straight allowance wins. 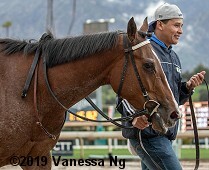 In to challenge her included 2-1 second choice Splashy Kisses, 8th in the Breeders' Cup Juvenile Fillies (G1) then 6th in the Blue Norther, and 4-1 Nomizar, a maiden winner at 4th asking last out. 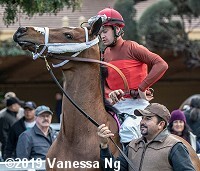 Jockey Rafael Bejarano sent Nomizar to the front through fractions of 22.35 and 45.12 while pressed by 9-2 fourth choice Thriving and stalked by Splashy Kisses. Into the lane jockey Kent Desormeaux sent Apache Princess to the lead from 4th through 3/4 in 1:10.15. Under a hand ride by Desormeaux who lost his whip at the 1/8 pole, Apache Princess drew off to win by 3 1/4 lengths over Thriving in 1:16.82. 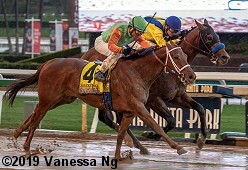 It was a nose back to Splashy Kisses third. Left: Apache Princess in the winner's circle. 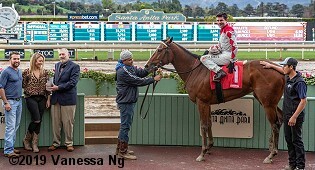 Winning trainer Keith Desormeaux said, :"I picked this (whip) up off the track for you! Thanks for the ride." Right: Apache Princess heads back to the barn after the race. 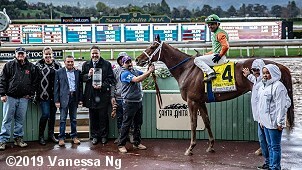 Winning jockey Kent Desormeaux said, "I had already asked her and encouraged her for the best, I encouraged her three times and I was underhanded and when I tried to raise it, it just went towards the earth. That's embarrassing, but (it's) the second time I've done that with her and she's won the race for me. She proves that she doesn't need it, she just needs encouragement with my mouth. If I kiss at her, shake the reins at her, throw crosses and she continues." Left: Second place finisher Thriving in the paddock before the race. 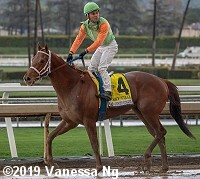 The Jeff Mullins trainee improved her record to 2 wins, 3 seconds, and 1 third in 9 starts, earning $48,909 for owners Red Baron's Barn and Rancho Temescal. Right: Third place finisher Splashy Kisses in the post parade. 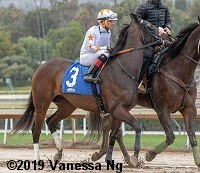 The Doug O'Neill trainee improved her record to 1 win, 1 second, and 1 third in 6 starts, earning $106,290 for owners EJ Racing, Phoenix Thoroughbred III, and Dave Kenney.